No matter how jammed your summer calendar is, you would be sorry to miss these excellent adventures. More to come – stay tuned. Babs Young will be there all day capturing the entire adventure. Miss Sadie and the Cowboy are resigned to staying at home, but your children would have a wonderful time making beads, designing t-shirts, listening to the storytelling. I will lurk in the vicinity of the music and the storytelling. The beloved family-owned “five and dime” has been a fixture in Central Lake since 1942. There will be a big birthday bash with cupcakes, ice cream, live music, bad jokes, and excellent storytelling. I wasn’t Around Here or anywhere else in 1942, but since 1996 it has been true that If Bachmann’s doesn’t have it I don’t need it. 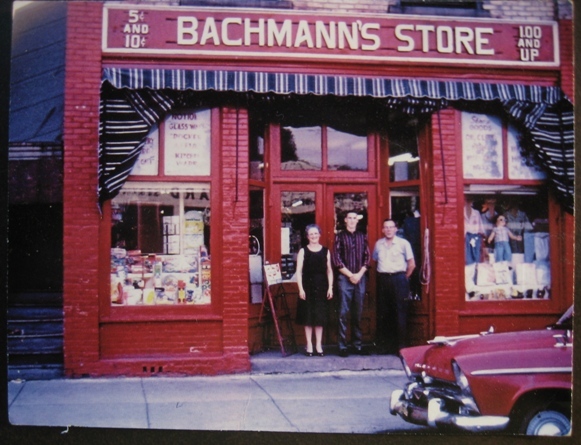 Historic Bachmann’s Store in the late 1950s – with founders Paul and Winnie Bachmann and their son Mike. 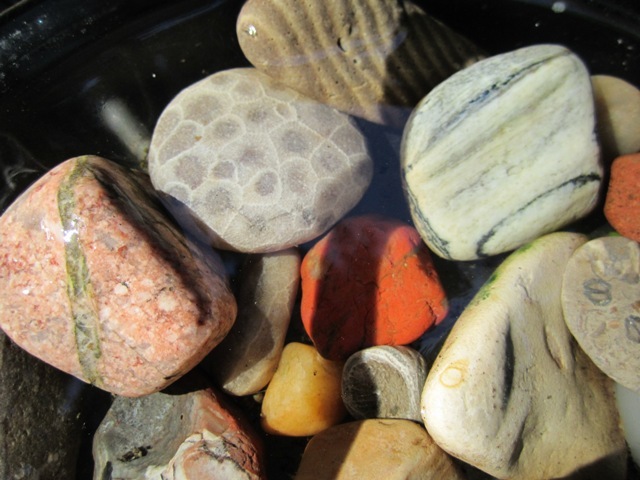 Prof. Jim McClurg will tell you everything you’ve always wanted to know about the rocks of Antrim County – and appraise one of those you’ve collected over the years if you bring it along with you. Miss Sadie and the Cowboy believe I should bring one of these, but Miss Puss sniffs and says that except for sentimental reasons they are not valuable in the least. I like the idea of antique rocks. Mick Jagger came to mind. I was tempted to add language clarifying that it was “antique rocks” we were talking about and not just “old crocks” – but I decided to leave our options open. Who knows where the discussion will wander once the Township is out in force? I will keep count of how many of us bring one or the other for examination. Your rocks rock, for sure. And I love that Five and Dime. There’s an old variety store still chugging along in the middle of Houston – family owned and established way back when. If you want a folding paper fan, a proper set of jacks or a bisque kewpie doll, you still can get it there. 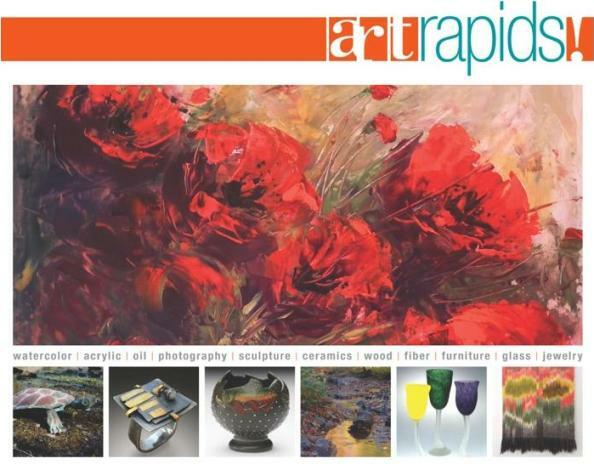 That Art Rapids poster is beautiful. I’d be hard pressed to choose between that and the rocks. We’ll take you to all three. Bachman’s store–very cool! As for the rocks, I’m a sucker for those pink rocks (granite?) with the green stripes (?). I’m sure Miss Puss is right about their value on the world market, but what do we care about that? We are blissfully indifferent to the market value of our bits and pieces – although fiercely protective of our work products! As is proper. What a great day you have lined up! Love all the photos…the dime store (we had the D&C store when we were kids that has since turned into some trendy restaurant), the rocks, the art poster…all so much fun! Can’t wait to read all about it! Can’t wait to do it all. I am so sad that I have a work day planned for the 30th. I’m going to miss Bachmann’s Party. Oh crap!. I am sitting here at the Writing Studio and Bait Shop trying to edit a pile of gibberish into a coherent chapter and mostly failing. My chances for getting to ArtRapids! are looking smaller and smaller. No fair.